One of the bigger surprises from Microsoft’s E3 press conference was the unveiling of Hidetaka “Swery65” Suehiro’s (of Deadly Premonition fame) new game D4, for Xbox One. An episodic murder mystery, D4 follows a private detective with the strange ability to travel back in time by touching certain mementos. The game sports a cel-shaded art style and all the usual crazy characters one would expect from the cult-favorite developer. The demonstration with the detective waking to find himself on a plane, a monologue exploring a bit of his background. Apparently, he gave up his memories for the ability to jump through time, currently searching for a way to jump to when his wife was murdered. 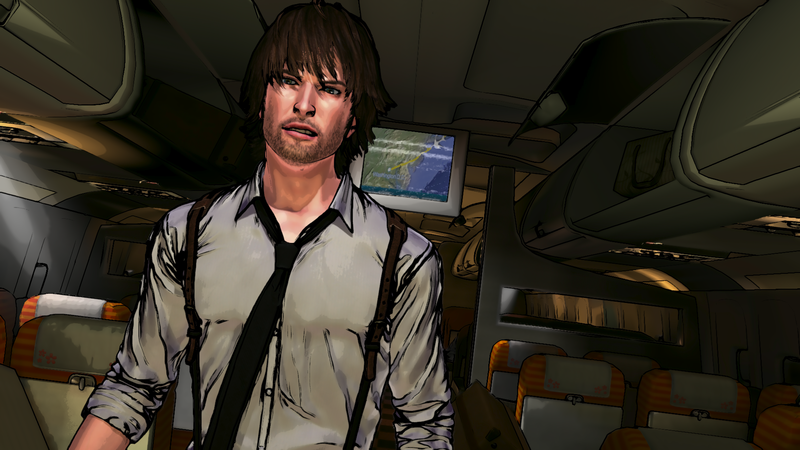 D4 is a story-focused game. Play is minimal, automatically moving between scenes to allow players to sit back, cook some popcorn, and enjoy the ride. D4 uses Kinect primarily in service of this, Swery describing the game as a “Kinect showcase.” It moves in a very linear fashion, but Swery alluded to side-quests of sorts being available based on how you speak to other characters. Doesn’t look like it, but this guy’s actually pretty upbeat. Dialog choices are a regular form of interactivity (though only one was shown in the demo), which can be selected either through hand gestures or voice commands. All choices are viable, but certain choices seem to award more points, which can be used to buy costumes. Combat, performed through a series of upward and downward swipes of the arms, also awarded these points for chaining successful strikes. The cel-shading gives D4 a rough aesthetic. Its style has a sharp, hardened look to it as opposed to the usual smooth, clean lines that accompany most cel-shaded games. Gives the game a distinctive flair, matching nicely with Swery’s usual, strange brand of creativity. No release window was given, but we’ll definitely be keeping our eyes open for more information.